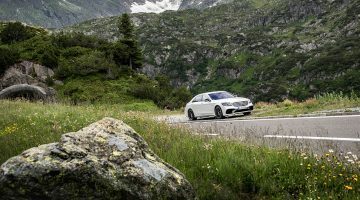 Unless you’ve been residing beneath a particularly well-insulated rock, it shouldn’t come as too much of a surprise to learn that Mercedes’ portfolio has been increasing dramatically as of late, with the new E-Class and S-Class Cabriolet among several others having been announced and launched in 2016 already. 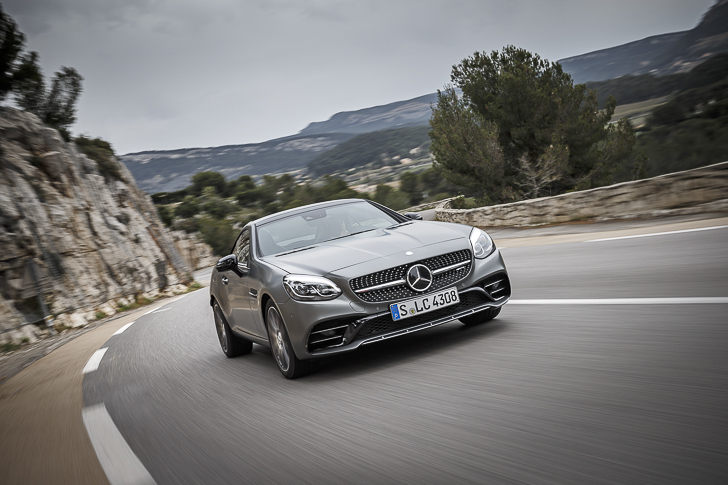 Marketing pre-amble aside, it’s all part of a drive to increase Mercedes’ already bulging product line-up from 32 to 40 – ‘or slightly over’ – by 2020, including some brand new niche models of which a new premium Mercedes pick-up truck and an extended AMG GT family are among the forerunners. At the other end of the scale though lies the refreshed old guard, the most recent of which is the SLK, now ‘re-launched’ in its 20th anniversary year as the SLC. Exciting news? Meh, perhaps, since the revised nomenclature only acknowledges the roadster’s close connection with the C-Class. Consequently the ‘newboy’ we’re here to drive in Nice is principally just a facelift of the third generation model that first appeared in 2011. Not really. Looks-wise, it’s not the most radical of deviations, with blink-and-you’ll-miss-them revisions to the front and rear bumpers, diamond radiator grille, and the now customary (and optional) LED headlights. The interior meanwhile features carbon fibre trim and a ‘higher-quality look’, but the now dated layout, button-fest centre consoles, and almost comically small gear lever mean you shouldn’t hold your breath if you’re anticipating a new design DNA. Fortunately technical changes are more significant. The retractable folding roof for example is now capable of being opened and stowed whilst on the move (until you hit 40kph, at least), and the luggage cover no longer needs to be moved manually to stow the roof. Some clever, package-focused witchcraft-ery means boot space has not been affected either: true, the luggage cover in place means anything larger than a shoulder bag for weekend jaunts might be tricky to pack, but at its height, there’s still a decent 335 litres available. What about power? Any difference there? Actually yes. 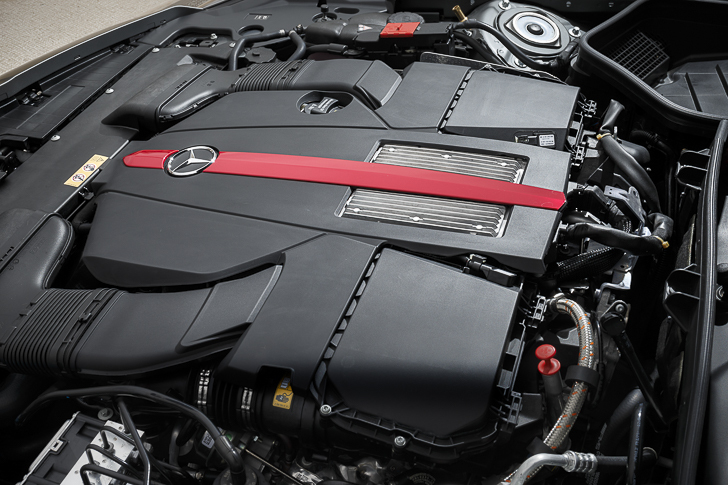 The big difference is the 3-litre twin-turbo V6 in our top spec SLC 43 and the new 9G-Tronic automatic that’s mated with it, the naturally aspirated 5.5-litre V8 having both been given the boot. Power and torque stand at 371bhp and 384lb ft respectively, enough for the SLC 43 to hit 100kph in a sprightly 4.7 seconds en-route to 250kph. I must admit though, whilst there’s nothing overly wrong with the SLC at full canter, there’s nothing particularly outstanding about it either. 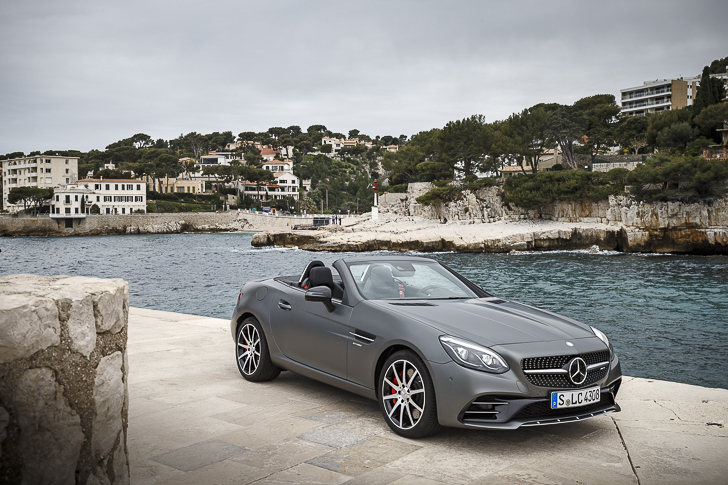 On the intermittent switchbacks of our test route from Saint-Jean-Cap-Ferrat to Sospel for instance, steering proved direct and accurate, and while the chassis might be getting on a bit now, still the composure of the SLC – thanks largely to its short wheelbase and squat nature – helped erode bodyroll almost entirely. Even the nine-speed gearbox was alert, the two gear ratios a welcome addition given the more nannying tendencies of the outgoing seven-speed box. When hustled then, the SLK handles itself well. How does the new Merc drive? Problem is, it’s not exactly the most engaging of experiences, the drive lacking the character that both the rivalling Jaguar F-TYPE and, more significantly, the new Porsche 718 Boxster have to offer. 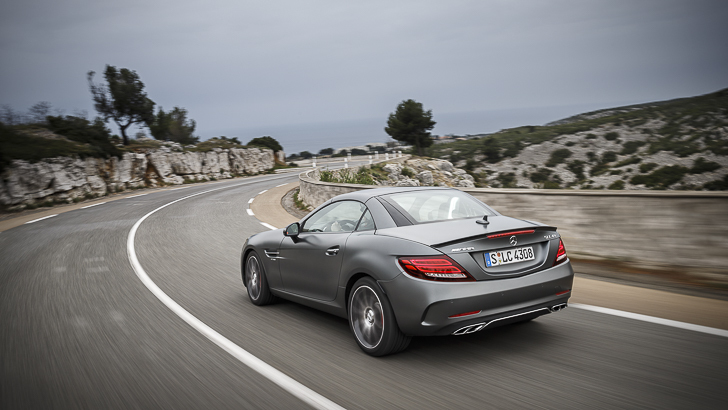 Acceleration for instance is smooth and linear, and torque is available much lower than the outgoing SLK. There’s even a decent engine note, complete with machine gun ‘pops’ on the overrun. It just feels a little soulless though. A little Germanic, in-keeping more with the three-pointed star than the ‘AMG’ badge of lunacy its ‘43’ engine now wears. You could even call it sensible, a ghastly adjective for an Affalterbach missile: part of the former SLK 55’s charms for instance was the V8’s more explosive turns of speed over its key rivals, a facet a drop of 45bhp and more linear acceleration has now neutered. The five-way Dynamic Select and stability control also prove irksome. In Sport+ for instance, steering weight is amped up slightly and throttle response made crisper, though the resultant twitchiness under inputs doesn’t exactly do the car’s composure any favours, and indeed doesn’t tangibly improve body control either (I’d stick with Sport). Traction control meanwhile, unless completely switched off, does have a tendency to interfere out of the sharper corners, with throttle response being held back momentarily and knackering momentum as a result. What does win the SLC some blue ribbons though is its surprising refinement at cruising speeds, the slightly jostling nature of the suspension on more rutted tarmac impressively supple at a cruise, the 9G-Tronic automatic proving similarly smooth. Plus, for a two-seater, there’s more room in the closeting cabin than you might think, even if the infotainment system could do with a refresh administered to its bigger brothers.